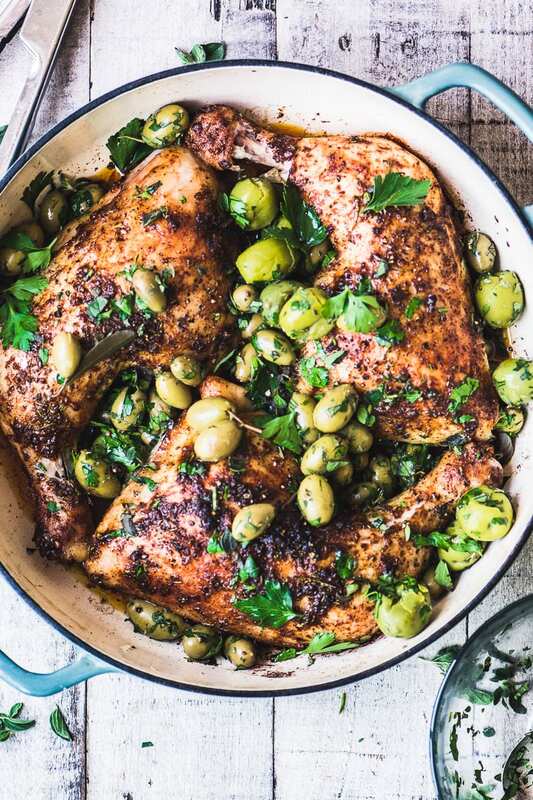 Chicken with Cracked Olives and Herbs ~ this is a fabulous one pot meal in the vibrant healthy Mediterranean tradition, it’s so easy to throw together, and it bursts with sunny flavor! This rustic Mediterranean style roasted chicken combines ease of preparation with lots of intense flavor. I think it’s a real season spanner ~ pop it on the outdoor grill in summer, or slide it into an extra hot (450F) oven when you want a cozy meal in mid-winter. 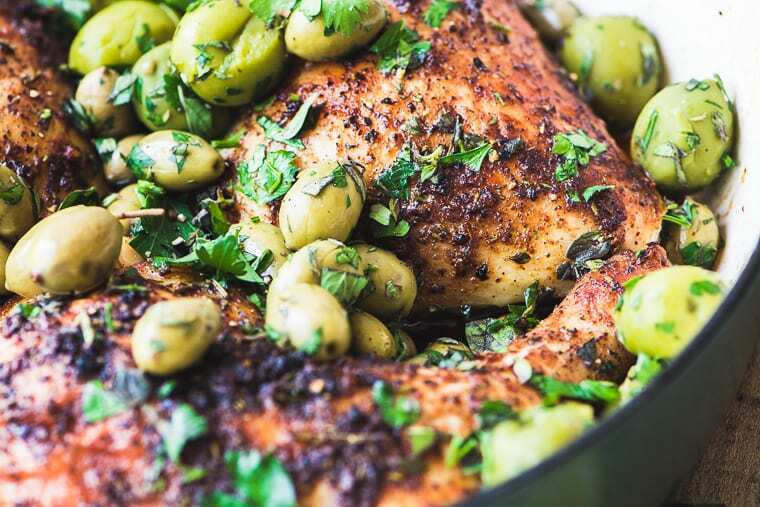 The chicken is rubbed with a zesty mix of aromatic spices and finished off with citrusy olives and herbs. Whatever the season, make sure you’ve got fresh herbs on hand for this recipe, dried won’t do. 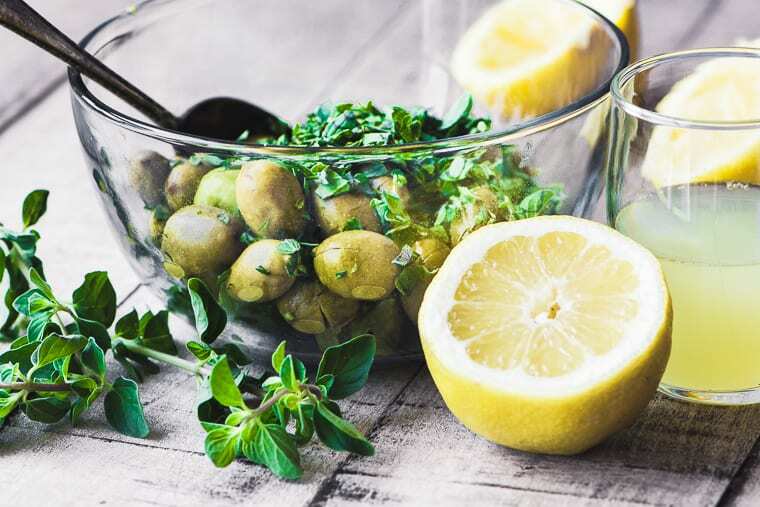 TIP: Even if you aren’t lucky enough to have an herb garden, visit your local nursery every few weeks and pick up potted herbs to keep on your kitchen counter, they’ll be cheaper and last much longer than anything you can get at the grocery store. The rub is an interesting blend of dried peppers with fresh minced rosemary. It gives the chicken and intense flavor and color. Aleppo pepper is a Mediterranean type of pepper that has a sweet/fruity flavor with a nice kick of heat. It has similarities to ancho chile powder, and to paprika. You can substitute smoked paprika, but add some cayenne for heat. You can find Aleppo pepper in some specialty stores, I found it at World Market, and you can buy it on Amazon, HERE. Cracked olives are olives that have been ‘cracked’ or split open before curing ~ the process allows the brine to penetrate quicker. Look for them in your supermarket’s olive bar, or substitute any green olive that you love. I love them for their rustic look and juicy flavor. TIP: If you can’t find cracked olives, use your favorite green variety and give them a tear by hand to release their flavor and open them up. If they have pits, put them under a clean dish towel and rap them ~ gently ~ with a hammer. It sounds a little odd, and my husband thought I was insane, but it works! Be sure to warn diners about pits. The high heat of the grill or oven gives this chicken great color, and cooks it quickly, so the inside says tender and juicy. If you do use your oven, make sure to crank it up to 450F, allow enough time to preheat fully, and use a pan large enough to hold your chicken in a single layer so it can really crisp up. I love my shallow enameled cast iron casserole for this job, it cooks evenly, keeps the juices contained, and can really get nice and hot. It makes a beautiful presentation, too. Some of the best flavors of the Mediterranean are highlighted in this healthy chicken dinner, I hope you try it! I think it would be over the top delish with some of my Homemade Pita Bread. You can do this with a whole chicken, roast it for approximately 20 minutes per pound. You can also use just breasts, or all thighs. If you don’t have Aleppo pepper, try a mixture of smoked paprika and cayenne. I also think sumac would be a nice option. 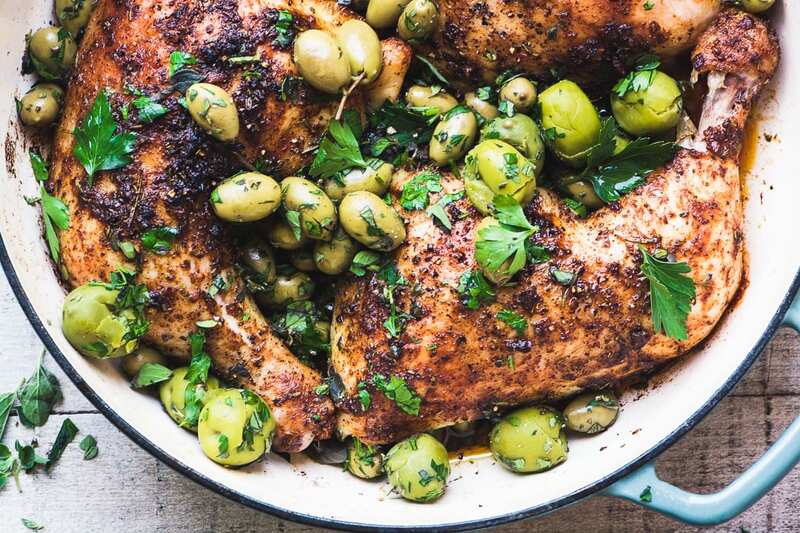 Don’t forget to pin this wonderful Chicken with Cracked Olives and Herbs! Can’t wait to make this! Looks sooo good. Quick question, what do you mean by “torn” olives? Never heard that before. The olives in the photos looked cracked…kind of like flattened or cracked with the side of a French knife blade. Sorry for the dumb question. Thanks so much! If your olives don’t have pits, you can just tear or split them by hand, or with a knife. It just refers to them being split open so the juices can escape and flavors can penetrate. Not a dumb question at all! I have so much fresh oregano in the garden and am always looking for ways to use it. 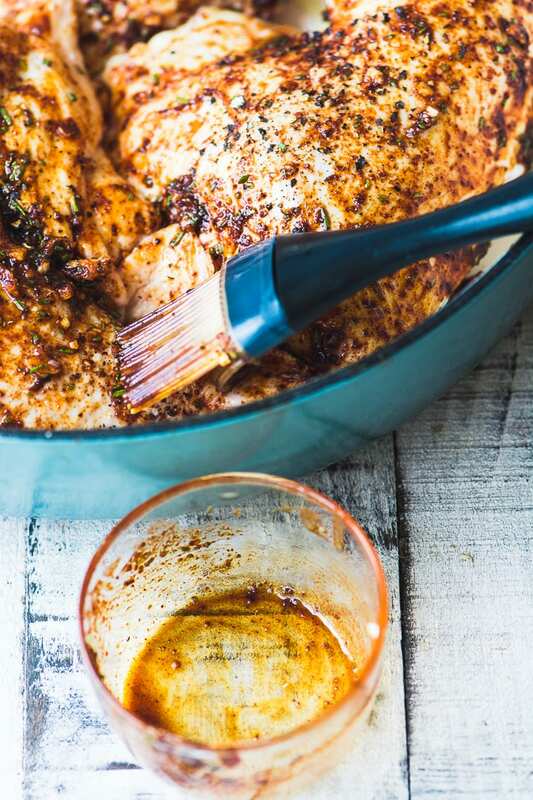 Love great chicken recipes and this looks like it fits into that category! Fresh oregano gets short shrift in recipes, I think, i love it, and don’t find it overpowering at all. Lucky you to have it in the garden. This chicken with olives recipe sounds wonderful Sue! 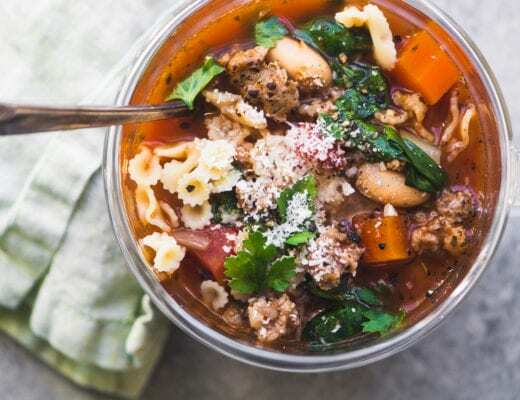 It’s on my list of recipes to try- always love the one pot dinners! I love flavorful dishes like this. I am sure yours is super delicious. I am pinning this for later use. This looks SO incredibly delicious!! And equally as beautiful. Gorgeous photos. Wow looks amazing! I’m making this tonight, can’t wait! Those pictures looks so inviting I love chicken legs cooked like this and that coating looks wonderful. I love your information about Aleppo pepper and substitutions for it – good to know. And your olive herb mix sounds perfect! Thanks Ginny ~ now that I found the Aleppo pepper for this recipe I’m finding all sort of uses for it, just put it on roasted potatoes last night, and I love the color! I just drooled :D well the pics are so crazy good and Aleppo is new to me! I would definitely look for it now. I have some Aleppo that I never know what do do with!! Now I have a scrumptious recipe that will thrill the family!! You’re on top of your game Liz, I had to hunt it down! Chicken, herbs, olives AND Aleppo pepper! Ah, this is what mediterranean-style-food-dreams are made of! These photos are amazing! 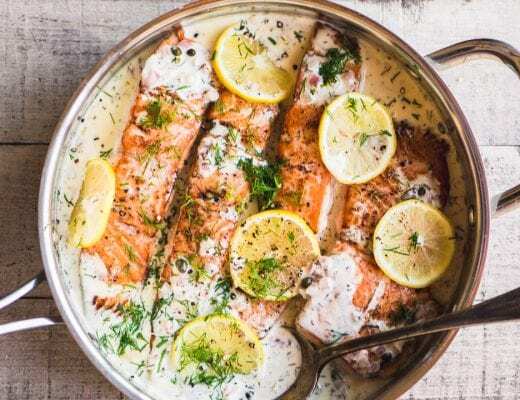 This sounds like a delicious dinner party meal, so simple get so elegant and unique! I love it! Sue, is it wrong that I want to lick the screen? 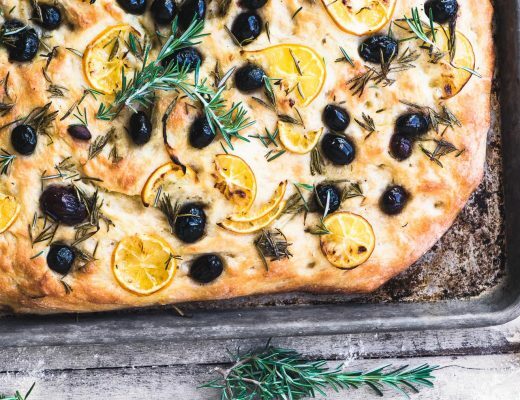 I love dishes like this — and the olives and herbs make it so bright and fresh. I made an heirloom tomato salad yesterday with a boatload of fresh herbs and some crushed olives — just like this. Fab! I just bought a vinatge pan like this..cracked olives..silly question..pits in? This is my kind of dish Sue! Love all the herbs and olives! Love that spice rub too! Me too, Tricia. This looks droolworthy, Sue. I love that rub and the olive herb mixture is such nice touch. I came to like olives later in life, but since then I’m kind of obsessed.